Whether you book via an online travel agency such as Expedia or you book directly with the hotel, the booking process can be cumbersome. Companies such as Trivago try to eliminate the need for searching around for prices from multiple websites in order to book a room. Trivago, in one of their television spots, says it is as easy as “putting in your check-in date, your checkout date and pressing the SEARCH button”. But is it really that easy? OK, you have searched, and they have given you lots of results, but you still need to go through each one to decide where to stay. Finally, you have to actually book. It is no wonder that 78% of hotel and lodging bookings and 86% of OTA bookings are abandoned (see below). 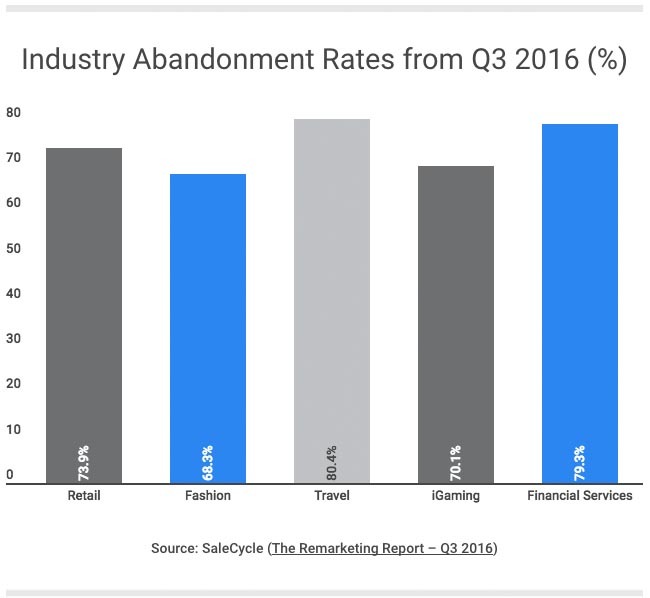 When compared to all other industries, travel tops the list for highest abandonment rates (see below). What is even more concerning when you factor in that other industries like retail are generally speaking non-perishable in contrast with the perishable nature of travel, making the travel abandonment rates far more concerning and critical to address. Then comes the personal dilemma. Are your preferences relative to when you are traveling with your family versus traveling when you are on a business trip? A person may have three to four personas related to their travel. Think of it, a different persona may be when you are traveling with friends on a golf trip versus a girl’s weekend in Vegas. The combinations on how a person would like to book their hotel room can be vast. Here in lies the problem. Booking engines are set up in a fashion whereby the booking process is very static. Room type or should we say bed type need to be picked first, and then you can continue with some options. Somehow this seems backward. With travelers spending more than $278 billion on accommodations in the U.S. last year, hotels that explore creative new ways to engage customers have the potential to significantly increase their profits. Phocuswright put out a paper on Travel Innovation and Technology Trends 2017. Within a section of this report, it is noted that the most important factors in the future of online travel is travel dreaming, planning, and shopping. As search evolves, it will more effectively be able to deliver results to the traveler that are pertinent to their upcoming trip. When so much effort is placed on deciding where to go when to go and obviously why are you going - why isn’t this same effort reflected in the hotel booking experience? Believe it or not, there is a wikihow website page devoted to teaching a person how to book a hotel room. The particular page is, of course, simple in its approach, but there must be a need for this type of education. If indeed there is a need, then why doesn’t the industry at large start to deliver a great hotel booking experience? The reason the hotel booking process is flawed is because we started from the wrong place. We are not truly giving control to the guest to book what they want. Priority should be given to selecting features that then result in a reduced choice of room types, or even better, selling features, and leave the room type organization to the hotel and to its systems. Juts leave the guest out of it. For example, if I am on a business trip, there will be certain constraints placed upon what I can book due to corporate travel guidelines. However, this doesn’t mean that I don’t want to have the flexibility to ask for choices such as a room on a high floor, away from the elevator with a view if possible. When I am traveling for pleasure, I may want all these same things as well as private balcony, which I am willing to pay extra for, overlooking the ocean and with a bottle of champagne waiting for me upon arrival. Hoteliers recognize the need for a holistic guest experience that transcends channels, but most attempts are falling short. Many operators have taken the “just get something done” approach to deliver a seamless booking experience. The unfortunate result of this quick fix method using traditional booking engine process is that it risks disappointing guests and even giving up revenue streams. We need to let the guests choose how they want to book a room rather than the imbedded technology force them to use a specific path in order to book a hotel room. At hospitalityPulse, we developed roomPulse and FIRE (Feature Inventory Response Engine) to finally address the missing foundation of the booking puzzle. Communication with the property based system using roomPulse enables a highly personalized booking path for each guest, allowing guests to select their desired room type, room attributes and features they are willing to pay more for, providing competitive differentiation from other hotel booking experiences currently dominating the market. FIRE uses predictive future room assignments to ensure what guests are offered to book online, also is what they can expect to receive when they arrive at the hotel. If a guest can be served better while also driving up profits, there is a strong reason for hotel companies to give guests what they want. The Hotel Technology Ecosystem - What Does the Future Hold? There's Hidden Money in Your Operation - and It Is Affecting Your Guest's Satisfaction Too! Who Cares If You're Losing a Little Money Here & There? Can The Front Desk Really Be Measured? Direct Booking Woes? Let Guests Buy Room Attributes!